As solar power becomes more competitive with each passing year, it makes complete sense to go solar, especially at places not connected to the grid or having high electricity requirement. One such place is a school or college. Modern day schools and colleges have a high requirement of power since most of them are centrally air-conditioned. Today’s schools have lifts and sophisticated lighting requirements that require more electricity. As such installing solar panels completely make sense for such organizations. i) Ample Funds – Once a school is fully established, it does not have much CapEx requirement. As such it is totally capable of incurring the one-time expenses involved in installing solar panels. Once that is done, the organization can continue to reap its benefits for years to come, in the form of reduced electricity bills. If they do not want to own the system, they can also lease it from a third party. ii) Reduce Power Bills – One of the major advantages of going solar is to break through the shackles of high electricity bills. Once your system is operational, it will last for some 25 odd years and will go a long way in reducing your power bills. Power from the solar system can be used to light common areas, corridors, outdoors etc. These institutions can also sell the excess power, if any, and enjoy a credit in their electricity bills. iii) Set a good example – A school is the most visited place by students and parents alike. Most of the parents are professionals from various walks of life. Seeing a solar system installed at an educational organization sets a good example for others and could play a vital role in driving the idea home. These people could then think and research about installing solar panels at their homes or workplaces, thus helping in reducing the overall carbon footprint. iv) Good Source of Education – A solar system installed at one’s own school/ college would make a child/ student more inquisitive about the idea of going solar. It could become a good source of learning about alternative sources of power. A solar system could also help in boosting enrolment of more kids by like-minded eco-friendly parents. v) Various options available – An educational institution can opt for installing a rooftop solar system since most of them have flat, empty and expansive roofs, or they can also install a ground mounted system if they have an empty land area available. Another interesting option would be to have a solar canopy over their open parking lots or install a BIPV (Building-Integrated Photovoltaic Systems) structure. 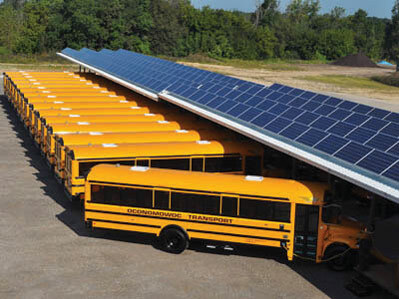 So, you see there are so many advantages of going solar by educational institutions. Not only, can they save on their energy expenditure but also set a good example for their students and society, reduce their overall carbon footprint and contribute to their long-term sustainability strategy. Many schools in the west are increasingly adopting the idea of going solar, given its many advantages. Also, read Solar – A Boon To The Indian Society!